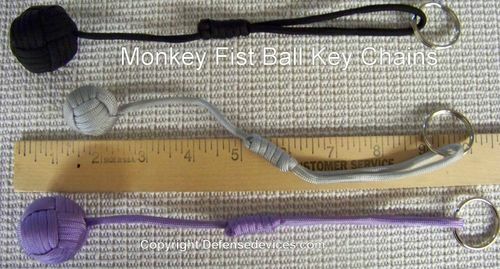 The Monkey Fist Keychain is a Solid stainless steel ball wrapped in paracord which multiplies your power to break bones and cause pain. Easily carried in your pocket. Sale, while supplies last! $4.00 off regular price. These defense keychains are made of 550 paracord and a solid steel ball. The steel ball is wrapped tightly with the paracord so it will never come loose. Can be used a number of ways, primarily to strike your target by swinging with either your keys or the ball in your hand. The actual striking surface may be the ball, but at your option can be the keys you carry as well. A strong 1 inch key ring is included. There are several ways to use this item in a self defense situation. From a concealed location in your hand or pocket, you can toss it in your attackers face. If it does not put him down, it will distract and disorient him for a moment where you can follow up with swinging the the Monkey Paw. Like a baton, there is no half way with this item. You will do damage and it can be severe. You may also wish to use other techniques and when close enough, swing the ball at the target to finish. There are many ways to deploy this Monkey fist, but please use your discretion as it may lead to serious consequences. So only use for serious self defense. The large monkey ball is 3 oz and 1.5 inches in diameter, the smaller one is only 1.5 oz and about an inch in diameter. The hangman's noose is adjustable to allow you to make the key chain longer or shorter according to your preference. The heavier model can easily cause damage. The lighter medium model, much less so. The paracord is nylon, very strong and will last a long time as it resists abrasions and rot. Large size is $1.00 more than the Medium size. This item might be considered a dangerous weapon in some areas of the USA and the user can face criminal charges if used or intended to use against another. Please check your local laws, ordinances about the use and possession of this product. We cannot possibly keep track of every jurisdiction in the US that may have laws affecting carry or use of this item. Unfortunately there are pretty specific statutes prohibiting the possession of "slung shots" and we will not ship to the states of CA, OK, FL, or MI. Fast shipping and the monkey is more durable than it looks in the picure. Definitely recommending to my friends! !